This entry was posted in Inexplicable Mysteries, Software Testing and tagged Software Testing. Bookmark the permalink. There’s an alternative explanation to Lands’ End. If you’re talking about the end of one land, then “land’s end” would be correct. But if you’re talking about the end of many lands, then “lands’ end” would be correct. A similar pattern applies to people’s names. This is Justin’s blog, but I also make replies on James’ blog. I agree that the “1 comments” business is a silly problem that capable programmers should be able to fix very quickly, but in order to fix it, they’d have to notice it and recognize it as a threat to Blogger’s image. However, so it seems, we’ve come to expect such mistakes and learned to ignore them. Quality is dead. Thanks for your post. I’m flattered that you visit my blog. Is it just me or does a simple “IF” structure take care of this? “Incidentally… ..a lot of people ask why the apostrophe in Lands’ End is in the wrong place. There have been some silly explanations along the way, but the truth is, it was a mistake. It was a typo in our first printed piece, and we couldn’t afford to reprint and correct it. Thanks. Funny thing is I had seen that exact URL and had intended to link to it but accidentally cut and pasted a more generic URL into my post. I’ll fix it now. Incidentally, the cynical side of me wonders if that is really “the true source” given that companies’ PR people can and do put a positive spin on the truth to make the company seem less inept than they actually are. Surely a simple “No of comments: x” statement would be an easier solution – no code changes, just a label / text change on the page. Regarding the Blogger.com bug, I think this is an interesting observation. But maybe it is a simple case of cost versus benefit. The cost may seem small, but when you are talking about a deployed code change, then it is never trivial. Perhaps the code where this needs to be fixed is rarely modified or deployed, then the value of this fix might not be worth changing it. Right now the code is dead simple, but any changes to fix this problem will introduce more complexity (albeit not much more). 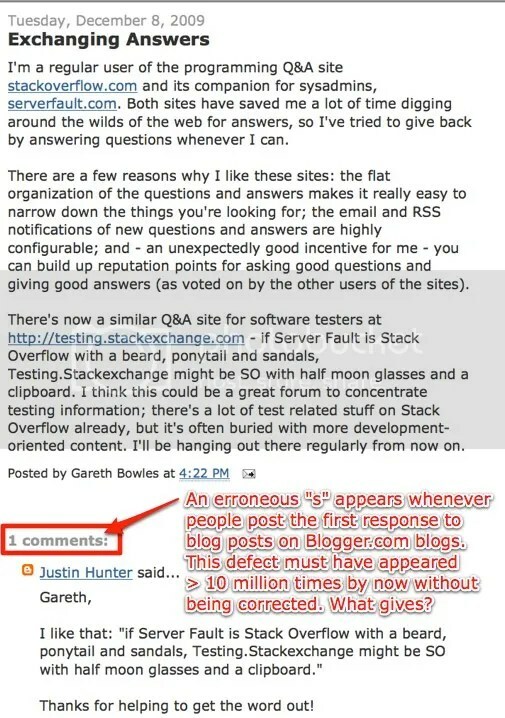 It then needs to be tested… don’t want it to say “0 comment” for instance. As for the ‘benefit’, it may be small. Probably very few users notice, and among those that do even less care. Of course now that you’ve called it out, the value of fixing it may have gone up. In the end who’s to say that the Blogger.com doesn’t have this bug filed and prioritized. It’s then a case of choosing what to work on in a given release… and maybe this bug just hasn’t made the cut yet. Thanks for your comment. If Blogger.com were a shrink-wrapped application, I would agree that the cost vs. benefit point you raise would make a lot of sense. But here’s the thing: Blogger.com is a web-based app. The cost to fix a simple bug and push it into production should be trivial. (For my company’s Hexawise test case generating tool, for example, we typically fixes bugs that have snuck into production within a day and we push the fixes into live production during the same day that they were reported). So that still leaves me confused as to why it has been unfixed for so long even though it has been seen hundreds of thousands of times. I suspect it has a lot to do with another thing you pointed out, namely “Probably very few users notice, and among those that do even less care.” I wonder, though, if anything else is behind it?